The Boston Red Sox traded for relief pitcher Addison Reed, left, on Monday, while the New York Yankees added starter Sonny Gray. 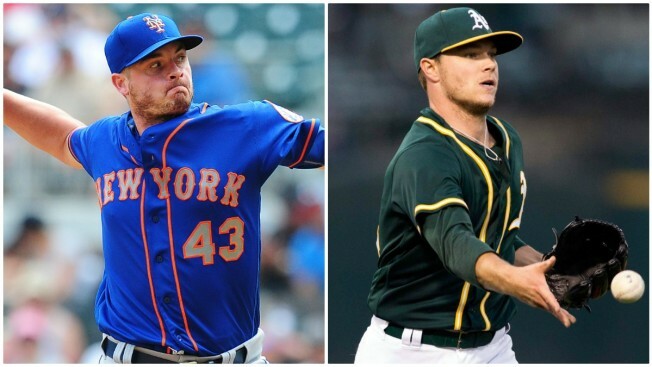 The Mets traded reliever Addison Reed to the Boston Red Sox for three 22-year-old right-handed pitching prospects: Jamie Callahan, Gerson Bautista and Stephen Nogosek. Boston began Monday a half-game back in the AL East race and were looking to boost their bullpen for a title run. A 28-year-old right-hander, Reed is 1-2 with a 2.57 ERA and 19 saves in 21 chances. He took over as New York's closer this season because of Jeurys Familia's domestic-violence suspension and shoulder surgery. The Red Sox already have a dominant closer in Craig Kimbrel. Reed has a $7.75 million salary and can become a free agent after the World Series. New York already has a replacement after acquiring Miami Marlins closer A.J. Ramos on Friday. Ramos is eligible for free agency after the 2018 season. Callahan, the 87th overall pick in the 2012 amateur draft, is 5-2 with a 3.21 ERA and six saves in six chances at Triple-A Pawtucket. Bautista is 3-2 with a 5.16 ERA in 32 relief appearances this year at Salem if the Class A Carolina League. Nogosek is 4-4 with a 3.06 ERA and 19 saves in 23 chances at Salem and Greenville of the Class A South Atlantic League. The division-leading New York Yankees also made a move Monday, acquiring starting pitcher Sonny Gray from the Oakland Athletics. Oakland gets right-hander James Kaprielian, a former first-round draft pick recovering from Tommy John surgery; Jorge Mateo, a top prospect who plays shortstop and the outfield; and Dustin Fowler, an outfielder who made his major league debut in June. New York also receives $1.5 million in international signing bonus allocation from the A's. Gray slots into the middle of a rotation that includes Luis Severino, Masahiro Tanaka, CC Sabathia and Jaime Garcia, who was acquired Sunday from Minnesota. A 27-year-old right-hander who has been slowed by a series of injuries, Gray is 6-5 with a 3.43 ERA in 16 starts this season and is 4-2 with a 1.37 ERA in his last six starts. He makes $3,575,000 and is not eligible for free agency until after the 2019 season.